For Koreans, alcohol is a lifelong companion in times of sorrow and joy. Korean people have enjoyed each other’s company over a drink of alcohol since the ancient times. Traditional liquors are made using excellent ingredients and are often called yakju, literally meaning “medicinal alcohol,” as moderate consumption of alcohol was believed to have health benefits and was offered from one person to another as a way to cherish friendships. Korea’s representative traditional liquors are makgeolli and soju. They can easily be purchased at markets and convenience stores from Seoul to even the smallest of towns. Their low price also makes them quite popular. For those looking for more quality products, special local liquors such as Gyeongju Gyodong Beopju, Andong Soju, and Munbaeju are highly recommended. These locally produced liquors are made using the traditional method, offering a deep flavor and taste. The liquors are usually packaged in luxurious boxes, making them perfect gifts. These liquors can be purchased at specialty liquor shops, department stores or specialty stores in each region. Of all of Korea’s traditional alcohols, makgeolli has the longest history. It is made by mixing steamed glutinous rice or wheat with nuruk, a traditional fermentation starter, and water, then leaving the mixture to ferment. It has a milky, opaque color and a low alcohol content of 6%-13%. It is relatively low in calories and high in proteins. It also contains high levels of yeast and lactobacillus. Idong Makgeolli, produced in Pocheon, Gyeonggi-do, has a sweet and tangy taste similar to carbonated water. Recently, different flavors of makgeolli have become quite popular, including yuja (citron), ginseng and omija makgeolli. The method for making cheongju is similar to makgeolli; cheongju is the clear liquor residue that is left after straining makgeolli. Cheongju has been widely used in a variety of traditional rituals and rites of passage, as it is regarded as a sincere and well-prepared alcohol. Cheongju is not only clear ("cheong" means clear), but also favorable and easy to swallow. Famous cheongju includes the Gyodong Beopju liquor, which is brewed in Gyeongju, Gyeongsangbuk-do. Another is Hansan Sogokju, traditional liquor with 1,500 years of history that is produced in the Hansan region of Seocheon-gun, Chungcheongnam-do. Soju is the most popular liquor in Korea. The most common type is diluted soju, which is mass-produced by mixing water with spirits, a process different from the traditional method. While all have the same soju base, locally produced alcohols are generally made using the traditional method of distillation and regarded as high quality products. Andong Soju is a type of traditional distilled liquor, aged for a long period of time for a deeper flavor. The distilling process has been handed down for years in Andong, Gyeongsangbuk-do. The original Andong Soju has a relatively high alcohol content of 45 percent. However, the soju is also available at 20-35 percent for those who do not prefer strong alcohol. Leegangju is one of the finest liquors from Jeonju, Jeollabuk-do, made by mixing in pears and ginger. Munbaeju, a traditional liquor of Pyeongan-do, North Korea, boasts deep fruity fragrance and is available in South Korea through the production by a Korean Food Grand Master. Gwasilju is the generic Korean term for fruit-based liquor. The method of making gwasilju can be divided into two categories; one is made from naturally fermented fruits and the other by mixing fruits and sugars with alcohol, bringing out more fragrant, fruity flavor. 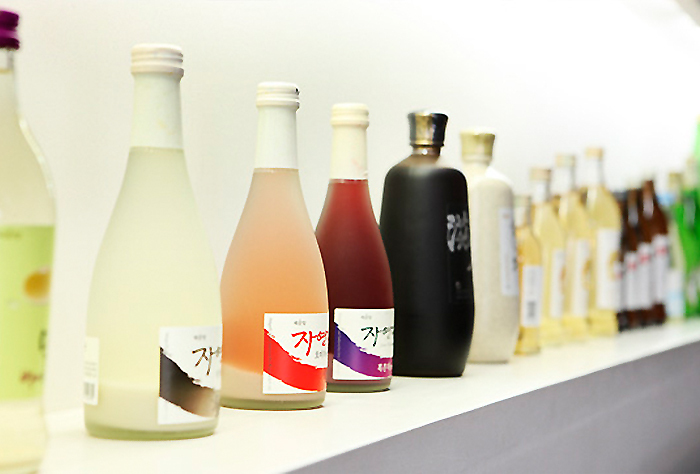 Bokbunjaju (Korean black raspberry wine), maesilju (plum liquor), and meoruju (Korean grape wine) are the most common gwasilju found in supermarkets and department stores.